As I was eating ice cream, I realized that when the frozen deliciousness touched directly on my teeth I experienced pain. I thought to myself, “Why are some people’s teeth sensitive while other peoples are not? Why does the temperature of the foods and drinks people consume make their teeth more or less sensitive? Are there any solutions to tooth temperature sensitivity?” As a person who suffers from tooth sensitivity to frozen foods and drinks, the questions mentioned previously are ones I have asked myself several times. However, I am not alone in my pain; millions of people suffer from sensitive teeth. Before I embarked on my search to discover what causes tooth sensitivity, I decided learning a little more about the tooth itself would be essential. I started with the anatomy of the tooth and found that it is fairly complex(see Figure below). The outer layer is a hard structure called enamel. Enamel is actually the hardest structure in vertebrates. The next layer is softer and thinner and is called dentin. The dentin covers the inside of the tooth which is also known as the pulp of the tooth. Tooth sensitivity arises when dentin is exposed to the environment of the mouth (Chemistry Provides Solution to Plug Pores in Teeth, 2007). Naturally, the next question I wondered was how dentin actually becomes exposed to the oral environment. After investigation, I learned that there are several ways dentin can become exposed. Examples of ways dentin can become exposed are brushing too hard, gum disease, gum recession, grinding of teeth, cracked teeth, age, whitening treatments, and acidic foods. Dentin can become exposed when the gum lines recede and the roots of the tooth, which are only covered with dentin and not enamel, are exposed to the environment. What are some ways the gum line can recede? Receding of the gum line can be caused by everyday practices such as brushing too hard or using a toothbrush that does not have soft bristles (Medicine, 2007). Dentin is made up of small tubules that can transmit fluids to the pulp of the tooth. The pulp contains soft tissue and several nerves so when liquid reaches the pulp the nerves become excited leading to pain. Extremely cold or hot foods traveling to the nerves can stimulate more severe pain due to not only liquid touching the nerves but the difference in temperature compared to body temperature. Aside from surgery, gums will not recover or grow back over the exposed dentin. If the dentin layer was responsible for all the pain myself and others were experiencing, I realized that knowing the structure of dentin would be essential to understanding possibilities for preventing and treating sensitive teeth. Dentin is a highly studied structure and is formed through a complex mineralization process involving sodium and calcium. Ninety percent of dentin is composed of fibrous collagen and the other ten percent is composed of other proteins. During tooth development, dentin is formed into a primary matrix at a very fast rate. The matrix gives a framework for mineralization. It is thought that an active transportation system exists between the matrix and the tubules because injured teeth have higher dentinal fluid calcium and higher sodium concentrations than intact teeth. After the primary dentin layer is formed, ostdontoblasts (cells in the pulp of the tooth that produce dentin) continue to form a secondary dentin layer around the primary dentin layer. The secondary layer of dentin is formed much more slowly than the primary layer of dentin and eventually causes the pulp chamber to decrease in size. The majority of dentin is primary dentin. The secondary layer of dentin is much less structured than the primary layer of dentin. The tubules of dentin form a matrix around the pulp, or inside, of the tooth. In the case of trauma and some dental work, a tertiary layer of dentin forms. This tertiary dentin can repair damaged dentin and is very irregular in shape and size (Dentin formation and mineralization, 2003). At this point in my research, I began to wonder if I would be doomed with living with sensitive teeth for the rest of my life. As I continued to search, I found that prevention, treatments, and recently even a CURE for sensitive teeth are possible. The key to prevention is to prevent gums from receding. Prevention can include practicing good oral hygiene and not brushing too hard. If good oral hygiene is not practiced, the bacteria that live and thrive in the mouth can cause diseases such as gingivitis and periodontal disease. Gingivitis and periodontal disease can eventually lead to gum recession. Brushing too hard one time will not cause sensitive teeth, however, after years of hard brushing, the cells on the gum line are worn away and gum recession occurs. If prevention of sensitive teeth is not successful, there are treatments available. Some toothpastes such as Sensodyne work to alleviate tooth sensitivity by temporarily plugging the tubules and depolarizing nerves using potassium nitrate compounds. However, this can cover up more serious dental health issues. There are also special toothbrushes on the market that are sensitive to pressure that have an alert when one is brushing too hard. For years, fluoride has been used and recommended by dentists and is even added to our water to improve bone and tooth health. Fluoride is used by the cells that make teeth and tooth enamel. Topical fluoride has also been a common treatment to make teeth harder. Topical fluoride can be administered in the form of pastes, rinses, and gels. Fluoride uses a re-mineralization effect to help harden teeth and prevent scratches and enamel wear from occurring and can also make teeth much more resistant to acid. Fluoride makes the crystals that are already present in enamel stronger to prevent acid and other substances from wearing off the enamel. Fluoride does not rebuild the crystals or the tooth enamel (Roveri, Foresti, Lelli, & Lesci, 2009). While fluoride is a good treatment option, it cannot replace the original structure of the tooth. The most promising solution for sensitive teeth I have found has the capability of not only relieving pain but also of rebuilding the enamel of teeth. Now, scientists have created a solution called Novamin. Novamin is proving to be a breakthrough in treating tooth sensitivity. Novamin is a tasteless powdery substance that can be added to toothpaste to reduce tooth sensitivity and pain. Novamin forms a thin layer over the teeth. Pain is reduced because Novamin can form plugs for the tiny holes thereby blocking fluid from reaching the nerves. Novamin is made up of the natural minerals that are already found in human saliva. However, by adding Novamin to toothpaste, the concentration of the minerals is greatly increased. The ingredients in Novamin are calcium, phosphorus, silica, and sodium. These minerals do not do much for tooth repair in their natural forms. However, in the rare ionic form these minerals are able to renew and regenerate teeth. Each Novamin particle contains the ionic forms of these minerals so when the Novamin particle reacts with water, whether it is saliva or drinking water, the minerals are released. The mineral ions combine with hydroxyapatite crystals which will plug the open tubules and help to reform the tooth. When the tubules have been plugged, liquid cannot travel down them and reach the pulp to excite the nerves to cause pain(see Figure below). Hydroxyapatite crystals also prevent the decay of teeth by reforming enamel once it has been worn or scratched away. Novamin can also be added to fluoride toothpastes to provide the same benefits as increasing fluoride levels by four hundred percent; however, with the Novamin added, there is not the risk of high levels of fluoride causing toxicity. Novamin can also protect against cavities by making the teeth stronger (Chemistry Provides Solution to Plug Pores in Teeth, 2007). This Jmol image is what the molecular structure of hydroxyapatite crystals looks like. There was a clinical study performed to determine the effectiveness of Novamin. One group of people with sensitive teeth was given Novamin and another group of people with sensitive teeth was given a placebo. The study was double-blind. This means that not only did the subjects not know what tooth treatment they were receiving, the researchers performing the experiment did not know either while the study was taking place. The testing was repeated five times and each time included two treatments. The results showed that Novamin caused a significant reduction (p<.001) in tooth sensitivity. The test group receiving Novamin and the test group receiving the placebo showed no differences at the beginning of the trial. At each time point the group receiving Novamin showed improvement in having reduced tooth sensitivity. Hydroxyapatite crystals(see Figure for structure) have many useful biochemical properties such as bio-compatibility, bio-activity, and can form bonds directly with the tooth or bone. 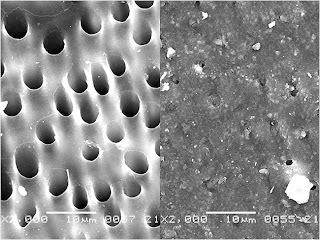 Once a layer of hydroxyapatite crystals have been applied to the teeth, improvement can be seen on a scanning electron microscope within hours. During a study it was observed that there was a significant difference between brushing with fluoride and brushing with hydroxyapatite crystals. It was discovered that when teeth were brushed after using fluoride, most of the fluoride molecules were brushed away. However, brushing after using hydroxyapatite crystals did not brush the crystals away suggesting that bonds were made with the existing tooth fairly quickly. Fluoride makes teeth stronger by changing physical and chemical enamel surface modifications while hydroxyapatite crystals actually showed re-mineralization (Roveri, Foresti, Lelli, & Lesci, 2009). 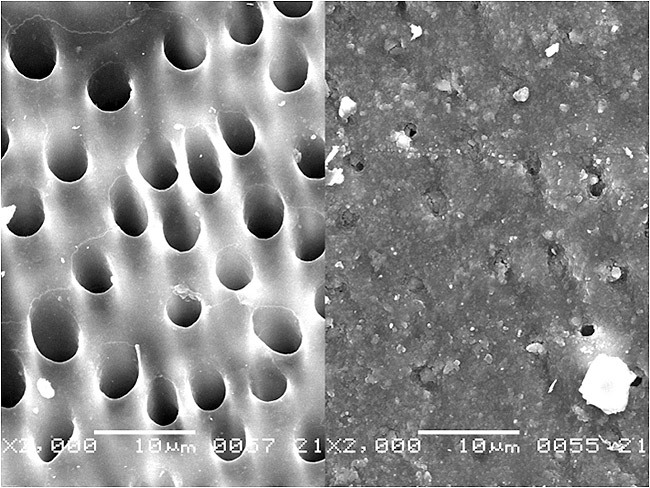 This picture shows the enamel of a tooth after Novamin has been applied. The picture shows how the open tubules in the enamel have been closed to prevent liquid from reaching the pulp. This diagram shows the chemical structure of hydroxyapatite crystals. The desire to have healthy, white teeth that last longer has been greatly improved by the use of hydroxyapatite or substances such as Novamin that contain hydroxyapatite crystals. Users of whitenings solutions or pastes no longer have to experience pain after undergoing a whitening treatment. Other options that have obtained patents include a silicate that that is made from mixing an aqueous solution of phosphoric acid, sodium silicate, and calcium phosphate. It is thought that hydroxyapatite crystallization will occur on the surface of the tooth when two different calcium phosphates such as tricalcium phosphate, calcium hydrogen phosphate, calcium dehydrogen phosphate, octacalcium phosphate or calcium pyrophosphate combine. Aside from relieving sensitive teeth and the pain associate with them, there is now a way to repair enamel, a component of the tooth that was once thought to be irreplaceable. 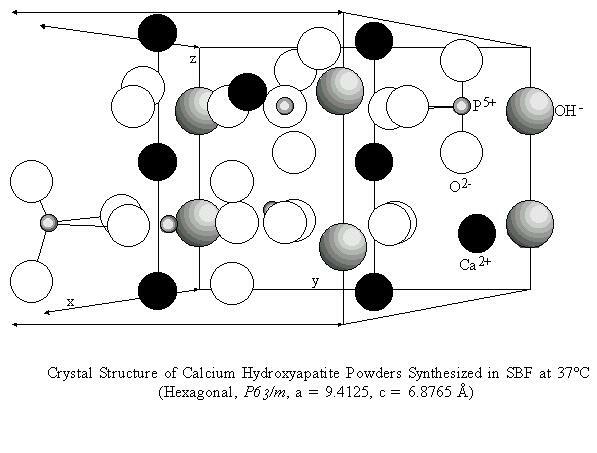 The future holds many prospects for hydroxyapatite crystals. Aside from the re-mineralization benefits, some scientists add them to toothpastes to deliver antimicrobial ions like silver and zinc which have been shown to deliver strong anti-plaque action (Roveri, Foresti, Lelli, & Lesci, 2009). It is no longer necessary for people to suffer from sensitive teeth. There are many ways to prevent, treat, and cure the dilemma of sensitive teeth. The solution can be as simple as brushing your teeth if you’re using the correct pastes. Roveri, N., Foresti, E., Lelli, M., & Lesci, I. G. (2009). Recent Advancements in Preventing Teeth Health Hazard: The Daily Use of Hydroxyapatite Instead of Fluoride. Advancements in Preventing Teeth Health Hazard , 197-215. As I was scrolled through the boundless thicket posts, I read your opening questions about tooth sensitivity & was interested to read more since I’ve asked myself the same questions before. It was really interesting to learn how teeth become sensitive; I had no idea that tooth sensitivity could be reversed or that you could add Novamin powder to your toothpaste to reduce pain and sensitivity. I think you did a great job writing your article and it would be easy for someone to understand that doesn’t know much about organic chemistry. I also liked the tooth anatomy diagram you added, it was a good visual aid when reading about the layers in the tooth. Great job! Hydroxyapatite provides high temperature protection to components that are exposed to combustion gases.